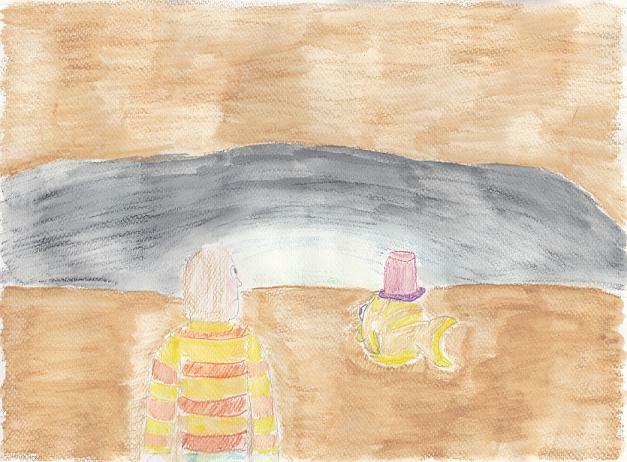 It had been several days that Jake and Orph had seen The Gill on Big Plaice’s horizon. It was huge and dark, like a giant cave, that entered into Big Plaice. A giant cave that expanded and contracted as Big Plaice “breathed” the water. Jake wondered, Is it safe to go in there? Would we get crushed? He voiced his concern to Orph, but Orph shrugged, in the way only a fish-shaped Orph can, blowing a few bubbles. Finally they stood in front of it, looking down into its dark depths. Jake noticed a faint blue glow emanating from it. There was something within making that glow, and Jake would have to face it. more laughter here – loving what you are doing! I haven’t heard of Haruki Murakami, but I’ll go look now!